The Plettenberg is a 5-star Relais & Chateaux Hotel built on a rocky headland with breathtaking vistas of the sea, mountains and miles of golden sand in one of the most spectacular resorts in Africa – Plettenberg Bay. 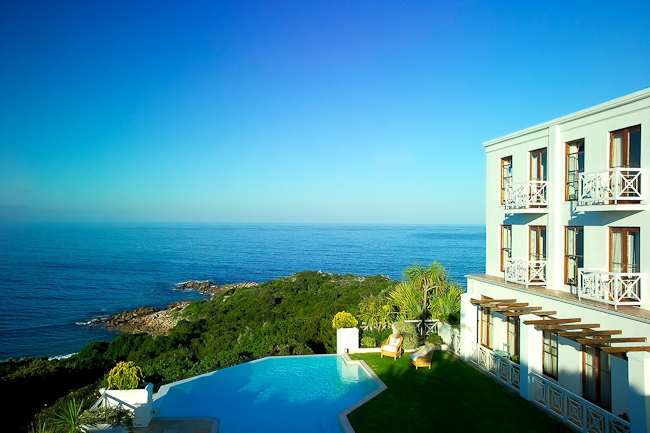 The Plettenberg is perched high above the Indian Ocean over Lookout Beach - a tranquil oasis in this International resort - with nothing to interrupt distant views of the Tsitsikamma forest other than the schools of dolphins at play. At the turn of the century, the original hotel building was a beach house belonging to the Thesen Family of Knysna. Today the Plettenberg consists of two buildings with equally spectacular views of the Indian Ocean and the Outeniqua Mountains. The two swimming pools visually flow into the ocean and miles of pristine beaches are just two minutes away. Enjoy breakfast in the sunroom, whilst watching dolphins at play and migrant whales during the winter months. The Plettenberg's 35 luxury rooms and suites are all air-conditioned and offer a truly idyllic and indulgent experience. There are two swimming pools, one of which is heated, and both visually flow into the ocean below. The adjoining Beach House is also available; the house is decorated with simplicity and crisp elegance in natural creams and blues and has it’s own sparkling swimming pool. Experience fabulous sightings of dolphins and whales in the bay from the hotel terraces. For the more adventurous there are numerous excursions and activities within close proximity to the hotel. With 37 superbly furnished rooms and suites including the luxurious Blue Wing, The Plettenberg invites you to indulge in an idyllic experience. Each room is exquisitely unique and all have under-carpet heating and air-conditioning. During the whale season from July to October, enjoy awe-inspiring sightings of dolphins and whales from the top suites. These suites are superbly and individually decorated with varied views of the sea. Most of the suites have French doors and step-out balconies. All of these suites have under-floor heating and are air-conditioned. These luxury suites consist of a separate lounge and bedroom. All suites have under-carpet heating and air-conditioning. These are large luxury rooms with sea views and small step-out balconies. All have walk in showers, under floor heating and air-conditioning. These rooms have different views -- some with side views of the sea and some with garden views. These spacious and comfortably furnished rooms have walk-in showers, under floor heating and air-conditioning. These standard twin and double bedded rooms offer the same exceptional style and décor found in the suites and luxury double rooms but do not have sea views. These rooms are all air-conditioned. The Plettenberg Beach House is situated next to the hotel’s main building. Decorated in soft creams and blues with bleached wooden floors, it makes the ideal private getaway, while still having access to all the main hotel facilities and a 24-hour butler service. The Beach House consists of two en-suite bedrooms, a large sitting room with fireplace, dining room and small service kitchen. The main bedroom leads onto a sundeck and private swimming pool, with spectacular views of the bay and mountains. The house is fully air-conditioned. Overlooking one of the world's most beautiful bays, this African contemporary house enjoys a view of magical sunrises, whales breaching in the winter months, and pods of dolphins rejoicing the whole year round. Gentle sandy and ocean colours filter through the house with a mix of textures and lighting that creates a warm and relaxing atmosphere. A mix of dark stained floors and sisal carpeting are throughout the house. The main bedroom boasts an incredible view and leads out onto the deck and private pool. Sheers and heavy curtains play on the windows giving a romantic feel to this bedroom. The open plan lounge and dining room are on a split level. From here you can enjoy beautiful ocean views. The galley kitchen is well stocked and beautifully designed. The house is equipped with flat screen televisions, DVD player in the lounge, air-conditioning and every other mod con one could imagine. The Plettenberg's facilities include a wine cellar, stocked with a selection of the best local wines and available for special occasion private dining, and a gift shop - offering a unique selection of specialty items and clothing from the area. The Carchele Health and Beauty Spa at The Plettenberg is a revitalizing experience. A comprehensive list of treatments promises an experience that soothes the body; mind and spirit to leave one feeling refreshed and revitalised. Facilities include a Steam Room and a Dynamic Hydro Bath Table for Mud and Gel Body Wrap treatments. The Plettenberg's restaurant, Sand, was voted one of the country's top 100 dining establishments in the Diner's Club Annual Awards, and the team of chefs has won several awards at the annual Knysna Oyster Festival. Plettnberg's Executive Chef is Christiaan Campbell. Sand's décor is a subtle blend of creams and off-white tones, contrasting with rich redwood shades. Wooden floors add to the ambiance of nautical elegance and simplicity. The restaurant extends outwards, with a sunny enclosed terrace, opening onto the outdoor terrace and pool. This provides spectacular views of the bay and the distant mountains. An absolutely idyllic restaurant to enjoy a gourmet meal. The Sand is open for breakfast, lunch, dinner and tea. Breakfasts offer a sumptuous buffet of fresh fruit, cheeses, cold meats, cereals and yogurts, or a full cooked English breakfast of your choice. Keep an eye open for the chef's special "cooked breakfast" selection. The lunch menu offers a variety of light meals, salads and sandwiches, which can be eaten on the terrace, while watching dolphins and whales at play in the bay below. Sand at the Plettenberg serves global cuisine prepared with special emphasis on fresh seafood and local produce. A Chef's Selection is offered on a daily basis plus specials of the day. For that special occasion, treat yourselves to a romantic dinner for two in the Plettenberg's state-of-the-art wine cellar, surrounded by bottles and bottles of the best South African wines featured on their award-winning wine list. In keeping with an annual tradition, the hotel is introducing the best of South African wines in conjunction with a superb 4-course gourmet experience. The Plettenberg is proud to announce that they also recently received The Diners Club "Platinum Award" for their wine list. Plettenberg Bay is a holiday maker's paradise and the eco-tourist's dream. Its eternal weather ensures days of warm comfort and lazy, pleasurable evenings, seldom found anywhere else. It is home to vast expanses of unspoiled Cape flora, delicate eco-systems in wetlands and lagoons, forests of unsurpassed beauty, pristine sand dunes and sun bleached beaches as far as the eye can see. For the nature lover, there's an unparalleled wealth of fauna and flora. The rugged Outeniqua and Tsitsikamma mountains form the backdrop for an area encompassing no fewer than fifteen private and public nature reserves. The Tsitsikamma National Park is internationally recognised for its forests which harbour and conserve the giant Outeniqua yellowwood - one of the few true monarchs of the world's forests. Tsitsikamma National Park is also Africa's oldest and largest marine reserve, playing a vital role in the preservation and conservation of marine fauna and flora. Hikers from all over the world visit the area which is known for its rugged, unspoiled coastline - a photographer's dream. The region has many scenic hiking trails of which it is justifiably proud, though its greatest asset remains the world-renowned Otter Trail. You can visit Harry, Sally and Duma, at the Knysna Elephant Park, just a few kilometres out of Plett, where you can learn more about these fascinating animals and enjoy the walking trails and picnic in these beautiful surroundings. 16km East of Plettenberg Bay is Monkeyland, the world's first sanctuary for multi-specie free-roaming monkeys. At Monkeyland, previous caged monkeys from several continents are rehabilitated and released in a 12 hectare forest and visitors are able to view them by being taken on monkey safaris by game rangers. Scenic flights are offered by African Ramble - who specialize in low-flying scenic flips along the magnificent coastline, including a spectacular view of the majestic Tsitsikamma Mountains and the Knysna Heads and inland over huge tracks of indigenous forest. Open Cockpit Gliders offer free flying over the stunningly beautiful Plettenberg Bay Lagoon. A flying experience not found anywhere else in the world, flights are tailored to suit the individual - from the "Gentleman's Aviation Carriage" to a "Reverse Bungy" or "The Cobra". Visit the Plett Mountain Trout Farm - via a leisurely drive up the historic Prince Alfred's Pass. Rods are available for hire. Stormsriver Adventures offers blackwater tubing, abseiling, woodcutter's journeys, eco-cruises, mountain biking and snorkelling. And for a real adrenaline rush, the highest bungi jump in the world is offered form the Bloukrans Bridge - a jump of 216 metres! Nature's Valley boasts beautiful old yellowwood trees, wild bananas, ferns, etc. There are lovely walks in the nearby area, from the historic Forest Hall down to the beach, along the rocks to the Salt River Mouth and over to Blue Rocks, ending on the long golden Natures Valley Beach. Robberg Nature Reserve is an untouched peninsula that juts out into the sea. It boasts three hikes, varying in distance and has an abundance of bird and wildlife. Stanley Island is the only privately owned island on the South African coast. It is also a private nature reserve with a wealth of animal and bird life, deserted sandy beaches and indigenous forest. Many birds, Springbok, Grysbok, Klipspringer and Warthog can be seen at close quarters. Mountain biking and horse riding are popular pastimes and there are numerous forest trails to explore. Mountain bikes are available for hire from Outeniqua Biking Trail in Harkerville through indigenous forest, plantations and fynbos, with stunning sea views. Organized horse trails are also available. For anglers, there are great opportunities for both saltwater and freshwater fishing and fishing excursions and deep sea fishing trips are available. Many local companies offer wonderful boating trips to view the dolphins, whales, seals, sharks and birds with highly qualified personnel to guide you through the fascinating marine world and teach you more about the history and coastal geology. Scuba diving and snorkeling along the Garden Route are excellent. Sailing is available through local boat clubs and canoes are available for rental. Sea kayaking is also very popular in Plettenberg Bay. Particularly popular are canoeing/bird-watching trips along the Bitou River. Golfing is available at the 18-hole course at the Plettenberg Bay Country Club, which is also a Nature Reserve, boasting a wide variety of birds and small wildlife. Or visit the 9-hole Gary Player-designed course at Goose Valley. Plettenberg Bay also boasts a very popular Art and Craft Route. There are a great many local artists and crafters in the area, and they are well-worth visiting. Pottery, batiks, paintings, weavings and much, much more. Knysna is an unique, quaint town 25 kms from Plettenberg Bay, set on an extensive lagoon which opens to the sea through soaring sandstone cliffs known as "The Heads". Unique marine and bird species abound, including the Knysna Loerie and the rare Knysna seahorse. Galleries, flea-markets and festivals keep the visitor entertained in Knysna. It is also the home to the famous Knysna oysters, served at many of the local restaurants. Knysna's premier eco-experience is the John Benn Featherbed excursion. Cruises leave throughout the day, taking you across the lagoon to the heads. Here an open-sided safari tractor will take you for a guided trip through the John Benn Nature Reserve to the top of the heads, followed by a guided walk back down ending at a wonderful restaurant set amongst the trees, where a hearty lunch or dinner can be enjoyed before heading back to the mainland. The Outeniqua Choo Tjoe, one of the last remaining steam trains, will take you on a memorable and scenic trip from Knysna to George.